Thomas Wilson bought the freehold of a small plot of land on the side of Richmond Hill for £500 for the purpose of building a church for the local nonconformists. The chapel, with a gallery, was designed by John Davies (1796-1865), to seat a congregation of 500-600. He was a well-known architect who built up a significant practice in work for several denominations. The Richmond British School started life in a room under the lecture hall before being built at No 40 The Vineyard, where the new school was opened in 1867. Whibleys: Congregational Chapel British Schools - Healey T, master; Healey Mrs, mistress. The church was extended by some twenty feet to its present size with an apse at the north end. Vincent van Gogh, the artist, may have preached here. He certainly did so at the Methodist Church in Kew Road. 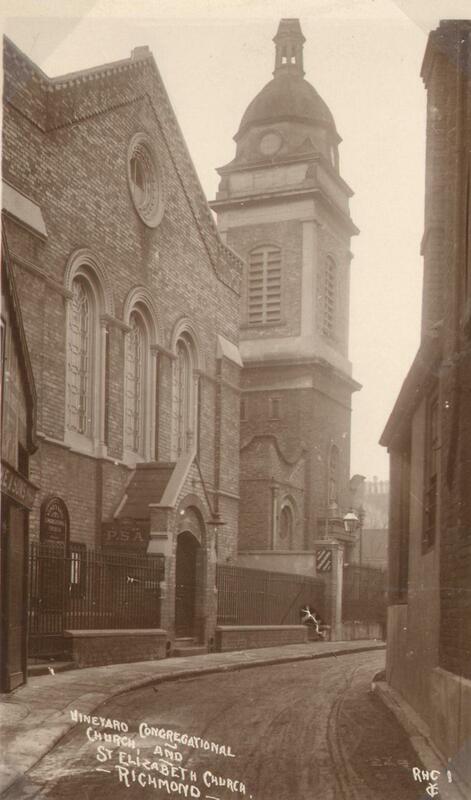 Lady Stansgate was a church member. She was the mother of Tony Benn, the Labour cabinet minister. Tony Blair, Prime Minister 1997-2007 lived in Richmond during his 'gap' year before going up to Oxford. He used the church basement, 'The Vineyard Hall', to organise pop groups and discos.